It was a historic moment for women's football as Ada Hegerberg of Norway became the first woman to be awarded a Ballon d'Or but the moment was dampened when presenter DJ Martin Solveig asked the footballer to twerk. 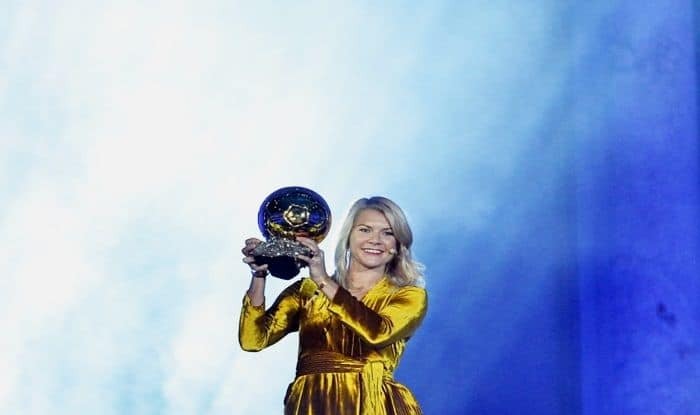 It was a historic moment for women’s football as Ada Hegerberg of Norway became the first woman to be awarded a Ballon d’Or but the moment was dampened when presenter DJ Martin Solveig asked the footballer to twerk. Hegerberg responded with a swift ‘no’ to the request before leaving the stage, immediately. Later, Solveig took to his official handle and apologised for what he called was a misunderstood situation. “Sincere apologies to the one I may have offended. My point was: I don’t invite women to twerk but dance on a Sinatra song. Watch the full sequence. People who have followed me for 20 years know how respectful I am especially with women,” Solveig wrote on Twitter. Speaking about the incident, Hegerberg admitted that Solveig did come to her afterward and was “sad” about how the things went on the stage. “He came to me afterward and was really sad that it went that way. I didn’t really consider it a sexual harassment or anything in the moment. I was just happy to do the dance and win the Ballon d’Or to be honest,” goal.com quoted Hegerberg, as saying. Hegerberg, who was named the UEFA Women’s Player of the Year in 2016, defeated the likes of Denmark’ Pernille Harder, Lyon team-mate Dzsenifer Marozsan, Brazilian forward Marta and Australia’s Sam Kerr to claim the prestigious Ballon d’Or. She has also won the French league, Coupe de France and Champions League three times apiece with her football club, Olympique Lyonnais.